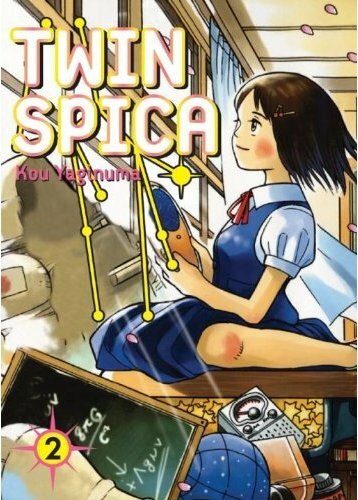 I haven’t seen the final list of this week’s comic book arrivals, but I feel fairly comfortable in naming the second volume of Twin Spica (Vertical), written and illustrated by Kou Yaginuma, book of the week. I was very taken with the first volume, which traced young Asumi’s efforts to win enrollment in astronaut school. The second shows her early days as a student and throws some new obstacles in her path. Some of those obstacles have real sting to them, particularly a discouraging teacher with his own agenda. It’s tricky to portray an adult targeting a child for reasons that have little to do with the child’s own behavior, as is the case here, but Yaginuma’s skill and delicacy in rendering a number of awkward and tense situations put my mind at ease. I feel certain that the fraught situation will yield satisfying dramatic consequences. It seems certain that the results will be more interesting than the average “bad teacher gets his comeuppance” outcome. There’s a lot of emotional meat here, both in the main story and in the glimpses of Asumi’s early childhood. Those flashback stories aren’t just nice bonus passages, as they help outline both Asumi’s passion for space and her father’s moody reluctance. They contribute to the emotional fabric that Yaginuma is building, which is becoming progressively more complex. I look forward to seeing how the back stories of the supporting cast – their goals and anxieties and their origins – are woven into the whole. This entry was posted on Tuesday, July 6th, 2010 at 11:25 am and is filed under From the stack, Vertical. You can follow any responses to this entry through the RSS 2.0 feed. Both comments and pings are currently closed.